Born in 2542 of the Third Age, Thror was the son of Dain I. Thror was of the Line of Durin. He had two younger brothers named Fror and Gror. Their family lived in the Grey Mountains. In 2589, Dain I and Fror were killed by a Cold-drake, a dragon of the Nothern Waste. Thror settled in the Lonely Mountain in 2590 with many of his people, and through him the Line of Durin continued. In 2644, Thror had a son named Thrain II. Thror happily ruled Durin's Folk in the Lonely Mountain for many years. Thrain had three children: Thorin II Oakenshield, Frerin, and Dis. In 2770, the dragon Smaug descended upon the Lonely Mountain and he slew many Dwarves living there. Thror and his son's family escaped, but they wandered the wilderness of northwestern Middle-Earth for many years. In 2790, the wandering companions reached Dunland and Thror had an idea. 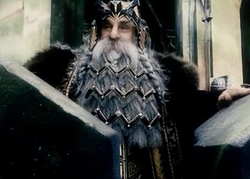 He decided to attempt to reclaim Moria, which was taken by Orcs and a Balrog in 1981 of the Third Age. Thror had a companion named Nar. Thror entered through the East-Gate of Moria, though Nar advised him against it because he worried about what may be lurking there. Nar did not enter Moria, but rather waited for Thor to return. A few weeks later, the Orc-leader Azog threw Thror's dead body out of Moria. Nar was not allowed to take Thror's body. Azog called Thror a thief, and told Nar to tell the Dwarves never again to attempt to reclaim Moria. Nar was spared by Azog, but Thor's body was never recovered. Thrór can be seen in the Old Norse poem Voluspa. The name means "burgeoning."